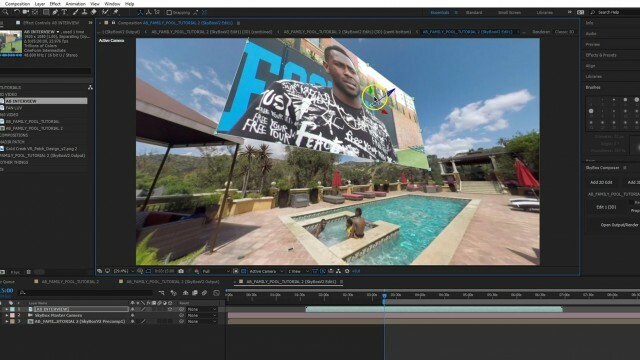 James Markham Hall, Co-Founder Gold Creek VR, shows us how to take care of some common 360° post-production tasks in After Effects. 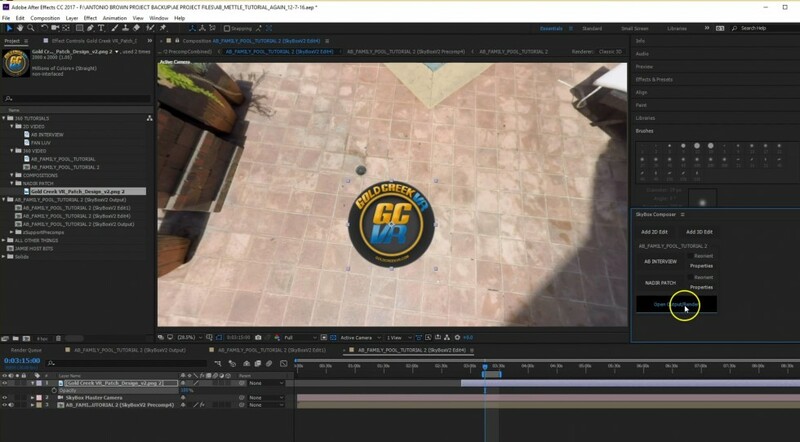 He uses the View-based Edit in SkyBox Studio V2 to place a 2D video window over 360° footage, covers the Nadir with a logo, and removes unwanted shadows. 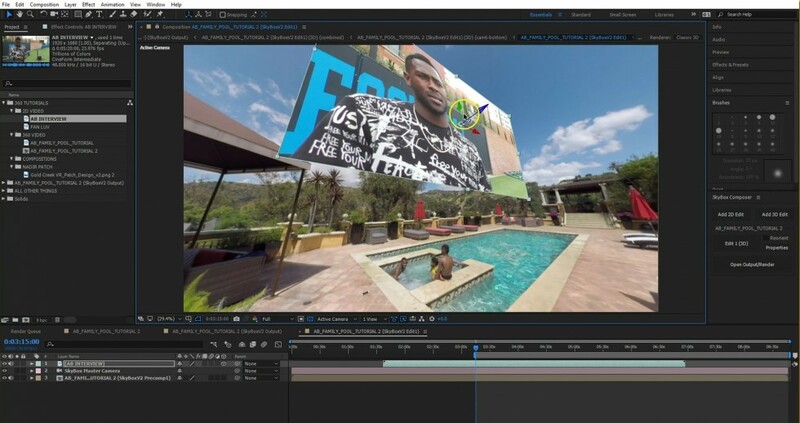 The tutorial uses footage from a 360 shoot at the home of Anthonio Brown, of the Pittsburgh Steelers. 360/VR Post techniques: Add 2D Video, Cover the Nadir with a Logo, Remove Shadows. Import your 2D video, and place it where you want on the X, Y and Z axis. Add a beveled edge to the 2D video window. Place a logo over the Nadir, covering the camera and tripod. Shadow removal with the View-based Edit. 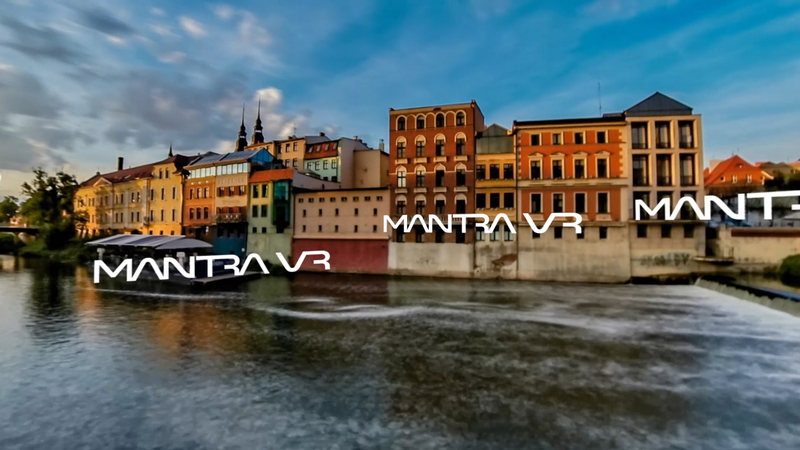 SkyBox VR Player lets you preview the final 360° view, similar to a smartphone or tablet view. 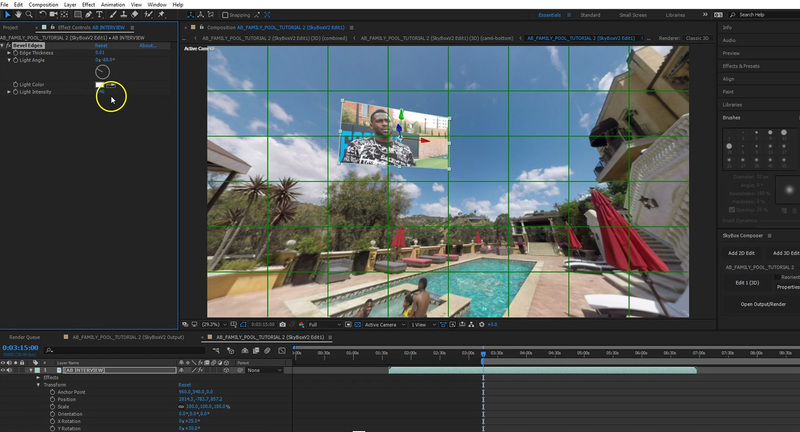 Composer is a great new feature for Skybox Studio V2 that allows you to do ‘view-based editing’! That means you can add your elements like you would with traditional footage. 1:11 SkyBox Composer is at the bottom, under the After Effects’ Window tab. 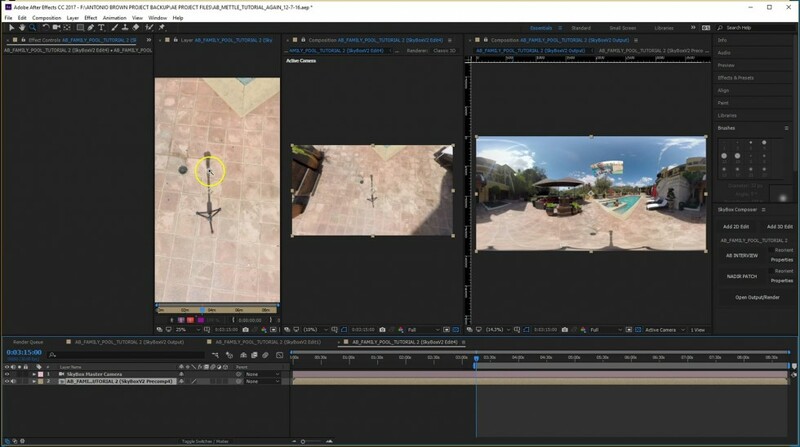 1:23 – ‘Add 3D Edit’ window… choose your composition in the ‘Select a composition with 360 footage:’ dropdown, then make your Comp Width the same as your source footage. Then click ‘Add 3D Edit’. 1:48 – Composer gives you an ‘end-user’ view of your footage. If you were wearing VR goggles, this is the Field of View that you would be seeing. Now, you can activate your Camera Tool, then click and drag to change your Field of View. 2:30 – … use the numeric transform fields to put it in the exact position and rotation. 3:06 – Click on ‘Open Output/Render’ in your Skybox Composer panel on the right to see the Equirectangular view of your composition. 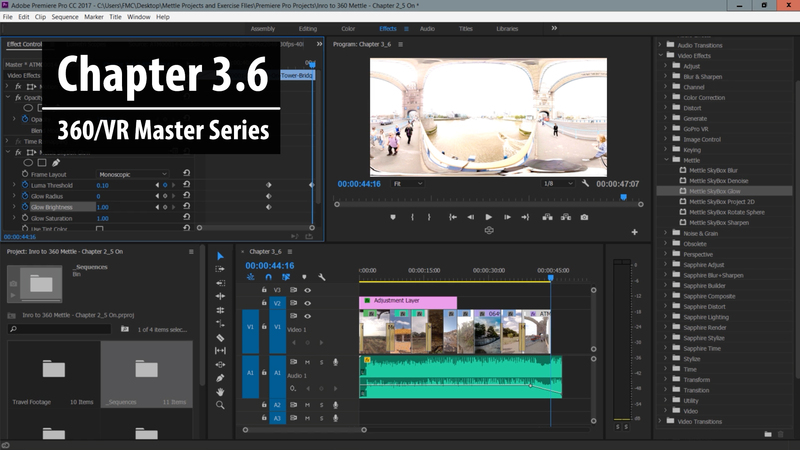 3:23 – Click ‘Edit 1 3D’ button to go back into edit mode, and make further adjustments to the element that you are working with. Add any effects to your element that you wish. 4:04 – Tripod shadows! Let’s get rid of that. 4:10 – ‘Add 2d Edit’, and as you did with the 3D Edit, select your composition in the ‘Select a composition with 360 footage:’ dropdown menu, then set your Comp Width. Click ‘Add 2D Edit’. 4:24 – With your Camera Tool active, click and drag to change your Field of View, looking down at the tripod shadow. 4:34 – Click on the ‘Edit 1 (3D)’ ’Properties’ in the Skybox Composer panel and an ‘Edit Properties’ window will appear. Name your Edit. 4:39 – Click on the second Edit ’Properties’ listed on your SkyBox Composer panel. Name your second Edit. 5:00 – Locking your Edit Window and opening a second Composition Window will allow you to effect changes in one window and see the Equirectangular result in the second window. 5:08 – Select your desired Composition layer in your timeline, then Right-Click>Open Layer. 5:16 – A new Composition Window will appear. 5:39 – Time for the ‘Clone Stamp Tool’! 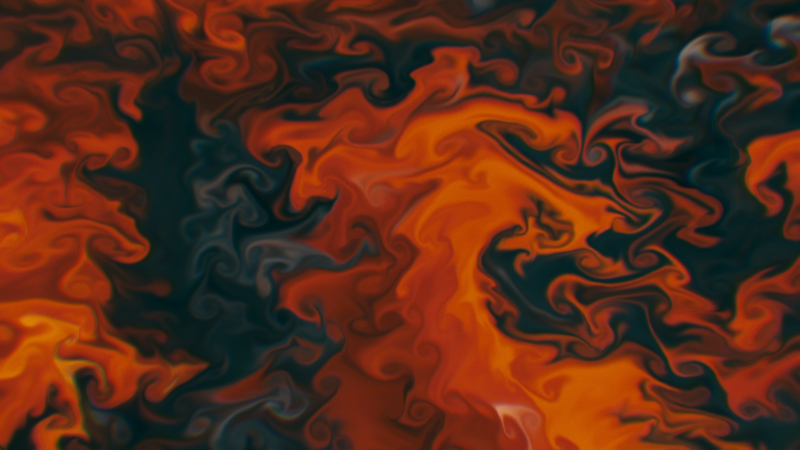 6:38 – Paint out your shadows, tripods, and whatever else you’d like to remove. 8:06 – Add a Nadir (bottom) patch icon or logo now, if you desire. 9:02 – Continue adding more elements as desired using the steps outlined above. James formed Gold Creek VR with producing partner Ted Faye with whom he most recently collaborated on Showtime’s top rated sports documentary “IVERSON,” revealing the life of NBA ALL-STAR ALLEN IVERSON. Their first VR collaboration is a historical documentary VR series “American Ghost Towns,” which has a featured channel in the SAMSUNG VR app. Their episode “American Ghost Towns: Goldfield” was awarded “BEST LIVE ACTION VR EDUCATIONAL FILM at VR FEST 2016. Gold Creek VR is partnered with GOOGLE EXPEDITIONS, adapting their award winning episode on Goldfield, Nevada into a Google Expeditions educational VR field trip which was one of eight VR experiences that Google Expeditions featured at the 2017 BETT educational technology show in London. Gold Creek VR has completed a pilot for their new VR series “HISTORIC TREASURES OF THE NATIONAL PARKS,” partnering with the National Park Service to focus on “SCOTTY’S CASTLE,” a damaged historic landmark at DEATH VALLEY NATIONAL PARK. 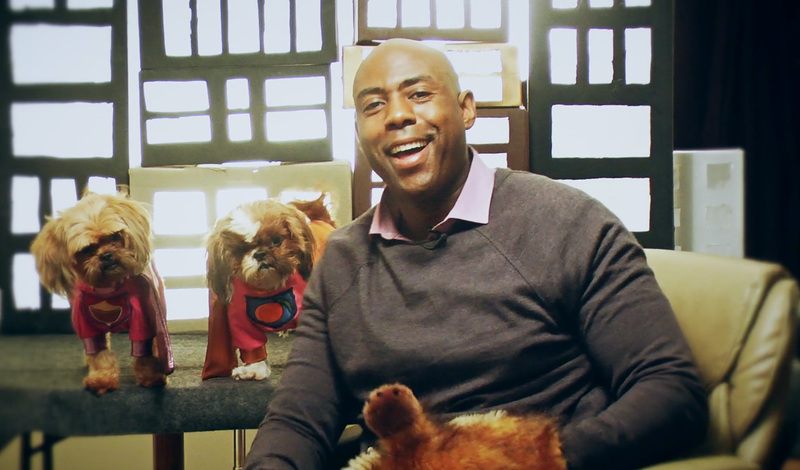 Thank you for the awesome video. The transcription helps too. I really think VR is going to completely overtake the way we watch, experience and share our stories. It will engage readers like never before. These effects are so cool. I can’t wait to try them out.